The Big Hits… On Small Instruments! Ukuleles are small. Yet, ukulele duet Greg Doyle and Wendy Matthews play the big hits, favoring swing and vintage tunes – as well as a few things you might not expect to hear on uke. The Fleas have been playing together as a ukulele duo since late 2006, united by a common love of the music from the 20s through 50s. As the Fleas soon discovered, ukes are perfect for these cheerful, melodic tunes. The Fleas feature both Greg and Wendy on vocals, often in harmony. Greg Doyle, on baritone uke, is a guitarist whose musical interests span Swing to Surf and beyond. He has been playing guitar since his teens and was a long-time member of Vic Schwarz’s Acoustic Workshop, a Hudson Valley-based, six-piece string band. Greg teaches uke and guitar privately. Wendy Matthews, on soprano uke, was charmed by the instrument’s portability and quirkiness, and took it up a few years back to accompany her singing. She has been singing and playing a variety of instruments since her teens. In a previous life, she was a member of Bad Attitudes, a four-woman music and comedy troupe. The Fleas have delighted audiences in venues as varied as the Clearwater Festival, Hoot on the Hudson, Ukulele Cabaret and New York Ukulele Festival, as well as street fairs, restaurants, libraries, art openings and private parties across New York, Connecticut, Massachusetts and Maine. On her travels, Wendy has also performed in exotic locales such as Honduras and Borneo! Looking for a great gift? The Fleas' full-length CD, "It Had To Be Uke" is now available! Get it directly from us: $15 + 3.50 if you'd like it mailed to you. Just use this link to our PayPal page. Also available for download on CD Baby and Amazon. Attention ukuleleists! 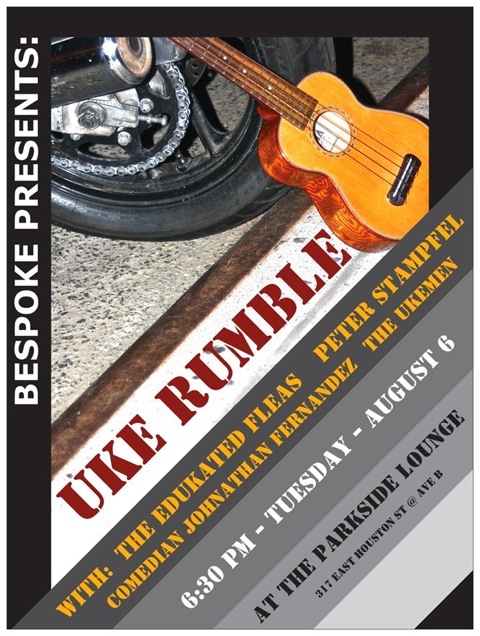 Dust off those ukes, and come join us for a great ukulele afternoon, hosted by the Edukated Fleas. There will be a terrific lineup of ukulele performers from Connecticut and beyond, including special guest Uncle Zac! PLAY ALONGS too! Yes, everybody gets to play, so bring your uke! We will wrap up with a ukulele open mic, time permitting. Refreshments available for purchase. Donation to support Sticks and Stones suggested. Don't miss the ukulele fun! Listen to and buy The Edukated Fleas music on CD Baby!